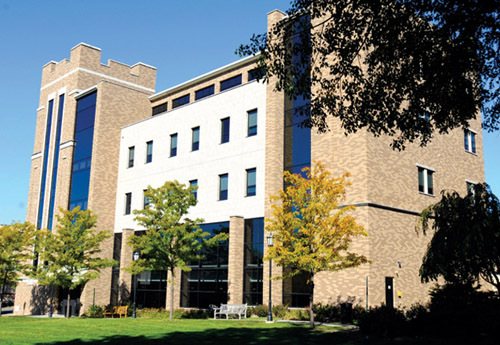 The Arthur J. Kania School of Management at The University of Scranton provides a Jesuit-inspired business education within a culture of excellence that prepares women and men for success. It offers a broad spectrum of undergraduate business programs and an on-campus and on-line MBA degrees. Accredited by AACSB International since 1996, Kania programs are increasingly garnering the respect of national and global entities. Adding value to the Kania experience are the school's membership in SAP University Alliances, its state-of-the-art Irwin E. Alperin Financial Center and Bloomberg Professional Services, and its Center for Practical Learning. The admissions committee requests the following from its applicants: Official GMAT scores, undergraduate GPA, personal essay, and letters of recommendation. Of those materials, GMAT score and GPA are of primary importance to the committee. Work experience will also be considered. Proficiency in English is an additional requirement. Admitted student...The admissions committee requests the following from its applicants: Official GMAT scores, undergraduate GPA, personal essay, and letters of recommendation. Of those materials, GMAT score and GPA are of primary importance to the committee. Work experience will also be considered. Proficiency in English is an additional requirement. Admitted students had an average GPA of 3.2 and an average GMAT score of 510. The Kania School of Management has a high acceptance rate. The Office of Career Services at the University of Scranton helps both graduate and undergraduate students find internships and full-time employment. They host work­shops on various career-enhancing skills, as well as maintain an online job database. Still, students feel there are too “few job fairs,” and that more of an effort needs to be made to assist students in finding “job opportunities after graduation.” The Kania School of Management has “a very strong reputation” regionally. This means that students, who are up for jobs in Scranton usually get them. Of those students who responded to the poll, 95 percent had accepted employment three months after graduation. They were placed mainly in the Northeast and Middle Atlantic states. Some of the employers who hired graduates were Kraft Foods, Lowe’s, PNC Bank, PricewaterhouseCoopers, and Sanofi Pasteur. Most of the learning at the University of Scranton is informed by the principle of Cura Personalis, which translates from the Latin to mean “Care for the Entire Person.” What this essentially describes is a respect for and appreciation of another’s unique needs, cir­cumstances, and gifts. These Jesuit values add an element of social responsibility to the work students do at the Kania School of Management (KSOM). Being a Jesuit institution does not, however, mean that the program is in any way light or insufficient. The MBA program at Scranton is accredited by the AASCB and “has a great reputation.” It simply means that in the process of achieving their goals, students can rely on each other for a sense of camaraderie and support. The program places an emphasis on globalization and the intersection of technology and business. “At KSOM the diversity of the learning envi­ronment mirrors the global and diverse business setting of today’s world. It offers an environment which is collaborative, values different ideas, encourages discussion, and lets the students think about phenomena in a very creative manner.” “The school offers many classes every term,” and in addition to the general MBA, stu­dents are invited to specialize in the following disciplines: accounting, finance, interna­tional business management, information systems, marketing, and operations manage­ment. There are also programs that allows students to jointly pursue both a BS and an MBA. In addition to the University of Scranton’s reputation and “forward thinking” atti­tude, are a multitude of amenities. The Irwin E. Alperin Financial Center has a simulat­ed trading floor where students can learn via market simulations. It even has an electron­ic ticker and news and data feeds. Also, the wireless system at Kania ensures 24-hour access to business applications and other online resources. The school prides itself on remaining “focused on what will be required of an MBA graduate in today’s market­place.” Both a full-time and part-time track toward the MBA are offered at Kania, and those already in the workplace commend the “convenience” and “proximity” of the school. The Kania School of Management is described as an “excellent learning atmos­phere,” where “everyone is friendly and willing to help.” “Professors are outstanding” and “provide critical insight.” They are great at bringing real-world experience “into the four corners of a classroom.” “They are all very well educated individuals, who take a lot of pride in teaching.” Professors are also described as “accommodating to their stu­dents.” As far as the administration is concerned, some say that “everything is smooth,” while others complain of miscommunications with advisors and possible language bar­riers for international students. As a member of the SAP University Alliance, our students also have the opportunity to work with the latest enterprise software such as the R/3 Enterprise Resource Planning corporate suite, which is used in many courses. One of our latest technological enhancements is the Irwin E. Alperin Financial Center through which business students at Scranton are getting hands-on experience with financial markets. The Center simulates a trading floor, complete with electronic ticker and news and data feeds, and in innovative courses such as Currency Trading and Analysis, students can experience professional applications of the stock and other financial markets through market simulations. Jason Miller Â’61 (Deceased) - Actor, writer, director: Wrote the Pulitzer Prize winning play Â“That Championship Season.Â” He also starred in motion pictures such as Â“The ExorcistÂ” in which he received a Â“Best Supporting ActorÂ” nomination. Want more info about University of Scranton, Kania School of Management Part Time MBA? Get free advice from education experts and Noodle community members.